I have found over time that Heitor Villa-Lobos (1887-1959) suits my ears very well. I can't recall hearing anything of his that I did not like, though naturally some hit me more than others. It's not just that he brings in his Brazilian roots as well or better than anybody. It's true but then I like his solo piano music, too, which often is a bit more "modern" than especially "Brazilian". So it does not surprise me that I am taken with the first volume of a projected series of unknown versions or completely unknown works, The Guitar Manuscripts: Masterpieces and Lost Works 1 (Naxos 8.573115). There is great variety to be heard here. A common element is classical guitarist Andrea Bissoli, who sounds perfectly well in the role of soloist. He has a great feel for the music and a touch that fits right in. The "Guitar Concerto" (1951/c1955) is a beauty, written for Segovia. There are songs for soprano (Lia Serafini) and guitar, some arranged from the composer's "Forest of the Amazon", some rearranged from the original piano-vocal versions, and a lovely guitar-soprano version of the aria from "Bachianas Brasileiras". Ms. Serafini sounds quite good. 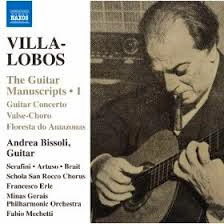 There are some forgotten solo guitar works, there are all kinds of things here (including three first recordings) and they are both well done and extremely worth your while if you love Villa-Lobos like me, or even if you aren't sure. I am already looking forward to the second volume. This is music to enjoy for a small Naxos price. If you have any loose change rattling around you should get this one if it sounds like it's for you.